The parish of Little Melton is directly east of Great Melton, about 6 kilometres west of Norwich city centre. It is small and irregularly shaped, with a sprawling village in the centre and south. There are few isolated farms and houses, but not many. A fair amount of fieldwalking and metal detecting has taken place, sites visits have been conducted, a few excavations have been carried out and a few historic buildings survive. Most recorded sites are located in the centre and east, with none recorded in the northwest. Prehistoric flint artefacts have been found at numerous locations. They include two Palaeolithic handaxes, possible Palaeolithic flakes, fragments of two Neolithic polished axeheads and two Neolithic hammerstones. In the south fieldwalking has led to the discovery of Neolithic and Bronze Age worked flints (NHER 19771) that suggest the site may have been used for the production of lithic artefacts. In the early 1990s prehistoric pits and possible Bronze Age hearths (NHER 29057) were discovered during a watching brief on line of the A47 Norwich Southern Bypass. The pits contained late prehistoric, Beaker, Bronze Age and Iron Age pottery. Other artefacts from the site include a Bronze Age chisel and fragments of two Bronze Age axeheads. Part of a Bronze Age axehead (NHER 17036) has been also been found in the centre of the parish. Iron Age pottery and an Iron Age coin (NHER 19771) have been collected from a site in the south, along with Roman metalwork and pottery. Several other sites to the north of the village have yielded Roman coins and pottery. Middle Saxon pottery and part of a 7th century bronze bowl (NHER 19771) have been found close to All Saints’ church, as have Late Saxon pottery and part of a Late Saxon stirrup. These finds suggest that the church site, in the west of the village, has probably been a focus for activity since at least the Middle Saxon period. Little Melton appears as ‘Parua Meltuna’ in the Domesday Book of 1086. The prefix ‘Parua’ is Latin for ‘Little’, with ‘Meltuna’ probably a mixed Old English and Old Scandinavian name meaning ‘middle farmstead or settlement’. Godric the Steward held the manor in 1086 and villagers, smallholders, slaves, ploughs, meadow, cattle, pigs and sheep were recorded. 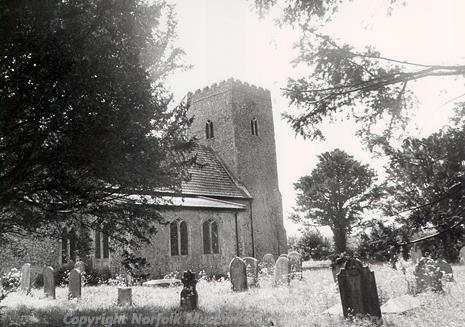 Most of All Saints’ Church (NHER 9421) dates to about 1300 and was restored during the 19th century. The rood screen is 15th century and there are 17th to 18th century memorials and a medieval font. In 2002 the digging of a pipe trench revealed a flint and mortar wall foundation and small fragments of late 14th to 15th century Flemish glazed floor tiles. To the south two connected medieval moats (NHER 9411) survive as earthworks. Three sides of the western moat remain and are water filled. All that survives of the eastern moat is an L-shaped pond. Faden’s map of 1797 suggests that the moats would have been located on the northwestern edge of Little Melton Common. Post medieval buildings in the parish include Grey Cottage, Manor House, a barn at Elm Farm and Steward’s House. Grey Cottage (NHER 40122) was built in the 16th century as a timber framed hall house. It subsequently had an upper floor inserted and various extensions added. Manor House (NHER 11625) dates to the early 17th century house and has later features. Its garden wall is 17th century, there is a 19th century privy and there are reports of a demolished dovecot. To the east of the church are the ruins of a brick windmill (NHER 9416). It appears on an 1836 map and was last used in the early 20th century. Ashwin, T. & Bates, S., 2000. 'Excavations On The Norwich Southern Bypass, 1989-91, Part I: Excavations At Bixley, Caistor St Edmund, Trowse, Cringleford And Little Melton', East Anglian Archaeology 91. Knott, S., 2005. St Mary and All Saints, Little Melton. Available: http://www.norfolkchurches.co.uk/littlemelton/littlemelton.htm. Accessed: 12 May 2006.
http://www.paintedchurch.org/lmelton.htm. Accessed: 12 May 2006.
http://www.norfolkmills.co.uk/Windmills/lt%20melton%20towermill.html. Accessed: 12 May 2006.